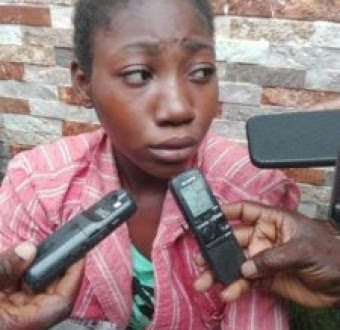 The police in Edo State have arrested a 14-year-old house help, Anna Amos, for allegedly killing her 70-year-old boss, Mrs Helen Adodo, by smashing the septuagenarian’s head with a stone while she was asleep. The girl said, "A spirit told me to kill her". The incident happened on August 7 in the Ikpoba-Okha Local Government Area of the Edo State. Amos, who was paraded by the Commissioner of Police, Mr Johnson Kokumo, at the state police headquarters in Benin, told Southern City News that she was influenced by “something” to commit the act. The teenager had earlier told sympathisers that the deceased was murdered by unknown persons. However, a video clip showed her confessing to the crime in the presence of some residents in the area. The JSS 2 student of Itohan Girls Grammar School told Southern City News that the aged woman’s head was smashed while she was asleep. She explained, “As I went to the veranda, something just entered my body. I did not understand what I was doing. I could not wash the plates I was supposed to wash.
“I removed the shoes I was wearing; I felt cold, so I wore a sweater with socks. I started scratching my head. I looked up and down and stood on the stone. Asked why she initially denied having a hand in her boss’ death, the teenager blamed the act on some unknown forces.